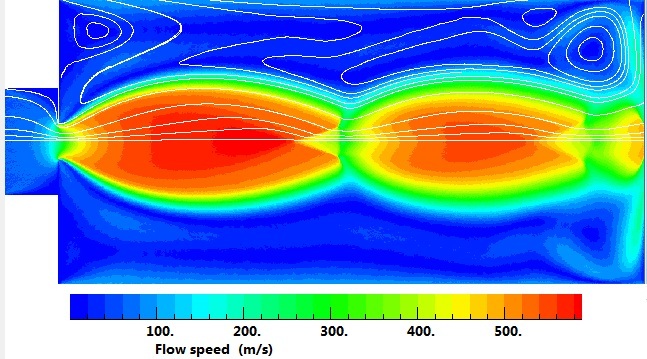 A screen image copy from the integrated DS2V graphics of the flow speed contours in a two-dimensional underexpanded jet of hard sphere molecules. The height of the slit is about a thousand mean free paths and the pressure ratio is ten. The complex external flow is because the velocity of the downstream gas is set to 100 m/s in an attempt to minimize the boundary interference. The calculation employed three million molecules (2.5 million in the steady state) and was made in a three day run on a laptop computer with a 1.6-2.6 Mhz Intel i7 CPU. The program reported that the number of molecules was too small and heat transfer coefficients would be in error by about 10%. At the same time, the flow contours can be expected to be accurate. A good calculation would have required 30 million molecules, but the laptop would still be adequate! The boundary conditions are simple and it should be possible to repeat the calculation with any two-dimensional DSMC program. It can serve as a reality check for alternative DSMC programs. The cylinder test case in notes prepared for the DSMC07 meeting in Santa Fe is also recommended.